An incredibly innovative model from Numatic that combines a high-powered yet economical to run vacuum cleaner with a janitorial trolley. The AutoSave system automatically starts in the economy, energy conservation mode, immediately reducing your power useage by half, exactly the same as switching off 10 x 60W light bulbs! If, at any time, more power is needed, one push of the switch gives you literally twice as much power . Running the vacuum in its eco setting also makes it quieter – ideal for areas that have to be cleaned when others are in the vicinity. 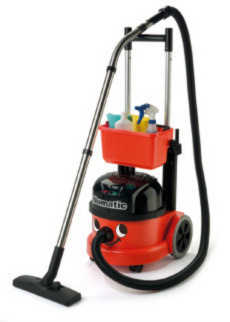 – The vacuum can be wheeled along over wide expanses of ground by extending the handle & tilting the vacuum back. – The caddy in the top can be used for transporting the small vacuum tools, cans of polish, toilet rolls or black sacks. – The vacuum tools & hose clip into the handle & the base of the vacuum so that they are easily transported & stored.